"These shrimp will knock your socks off! The batter doesn't overcoat the shrimp, which helps it maintain a wonderful flavor! Enjoy!" Preheat deep fryer or skillet with oil to 350 degrees F (175 degrees C). Dip the shrimp into the mixture allowing them to be completely coated. Then roll the shrimp in the breadcrumbs. Coat the shrimp well with the breadcrumbs. Mix up the cornstarch batter again. 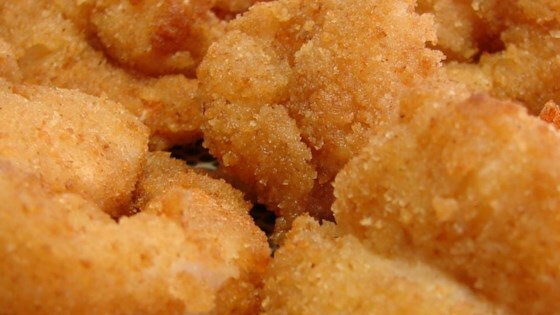 Dip the breadcrumbs coated shrimp back into the cornstarch batter. Roll the shrimp in the breadcrumbs for a second time. Repeat for each shrimp. Drop shrimp, one at a time, into the hot oil and cook shrimp until they are golden brown. Substitute beer for water for a great beer batter recipe.